Tsubakura Enraku (燕楽　玄鳥, Enraku Tsubakura) is a young scientist revered as a prodigy. They're known as a highly capable, experienced, and studious scientist, usually fond of researching and creating new weapons and spell cards. They are one of the main protagonists of the Len'en Project and a playable character in all games. Tsubakura has always been a young prodigy. They were so talented, that they even have their own research team and research lab, in which they spend day and night researching and building weapons. However, one day Tsubakura tried to make a nuclear weapon, which resulted in a terrible accident. Also, their mother died shortly after (it's unknown if she died during the nuclear accident or not). Also, the informant Suzumi Kuzu plagued Tsubakura and their friends constantly, to the point Suzumi tried to kill them. Because of their strong connections to Mugenri, the priest Tsurubami Senri decided to choose Tsubakura as their successor and spirited them away to Mugenri. They currently live at the Senri Shrine. Tsubakura is very straightforward and aloof with everyone. They can be condescending, as if trying to make fool of others, and often have difficulties expressing sympathy. Tsubakura is also a habitual trickster, from putting strange herbs in drinks to trolling Yabusame Houlen. Their personality has lots of contradictions, and people think their words and actions have no integrity. To put it simply, they're not understood well. They're also very knowledgeable and always give incoherent replies. Because of their incredibly high intelligence, they can come across as conceited, impatient and condescending at times to those not sharp enough to follow their explanations immediately. They are good friends with Yabusame somehow, much to their disbelief. They're implied to be homesick for the Outside World, but stay in Mugenri because they have no choice. Tsubakura specializes in technological weapons. They control nanomachine-like objects that resemble ink, and use them as weapons. They also perform their experiments on themself, such as remodelling their body structure so that they can't feel the cold. Using their scientific knowledge and aptitude for technology, they have created various spell cards and weapons. It's stated that Tsubakura can control ink and use it as a weapon (such as ink laser-rays or ink blades), but correctly speaking, it's not ink but actually an unknown technology, possibly using microbes or nanotechnology. They have the ability to quickly find out about anything interesting. However, for currently unknown reasons, they purposefully don't use this ability. This plays into their condescending attitude most of the time. 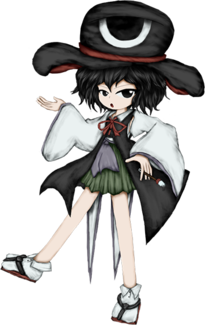 Their character may be a homage to Marisa Kirisame . Both dress in monochrome clothes with an oversized hat, they both attack with huge lasers, and both have complicated relationships with most of the cast and they are known for their trickster personalities. Also, it's worth to note that JynX has the same habit as ZUN to use the second character of main cast for icon of game executable file. Their full name is Tsubakura Enraku (燕楽　玄鳥). Their given name, Tsubakura (玄鳥), is the Japanese word for "swallow", a type of bird. The kanji in their name spells out a different word for swallow, and was probably chosen because it literally means "mysterious bird". Their last name, Enraku (燕楽) means "partying", most likely a reference to their ability of "enjoying that which is enjoyable", and it also uses a kanji for swallow. JynX created a poll on Twitter to revealing some information about the Len'en Project, with one option having a secret meaning to Tsubakura's name revealed. Because it received the least votes, JynX took pity on it and revealed the secret anyway: Each kanji in the name has a hidden meaning of either "black" or "white". 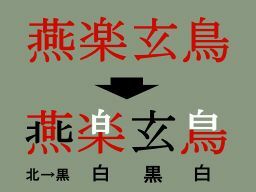 The kanji 楽 and 鳥 contain the 白 kanji in them, giving them the meaning of "white". The kanji 玄 has a nanori reading of くろ (kuro), giving it the meaning of "black". The 燕 kanji is the most complex of the four: Parts of it can be taken to form the kanji for "north" (北), which then plays into the philosophy of Wu Xing: The element that is associated with north is water, and the color that is associated with water is black. Paired with Yabusame's last name (Houlen, as in Len'en), theirs might also be reflected in the name of the game series: Enraku, as in Len'en. Tsubakura has short, neck length black hair and deep black eyes. They share the same eye color as Tsurubami Senri, and Suzumi Kuzu's blank personality. They are dressed in clothing modeled after many different types and genus of swallows, such as their red ribbon-tie resembling the red throats of most Hirundo swallows. Their black and white vest is strangely designed, being long on the sides and not covering the abdomen or back. This may be designed based on the black chests some swallows have, namely the black-collared and white-throated swallows. They wear two white bell sleeves on their arms. Underneath the vest is a sleeveless white dress shirt, with coat tails modeled after those of a swallow, a green skirt, and a purple-blue cloth tied around their waist. The cloth and skirt resemble the colors found on vibrant Tachycineta swallows, golden and violet-green swallow specifically. Although, most Tachycineta have at least the bluish color. Tsubakura wears an oversized, poofy black top hat. It has a dark red interior and band, sharing the same color as the ribbon-tie. This hat gains an eye resembling the Eye of Senri after the events of Evanescent Existence. It's implied that this eye is a physical, 'living' eye, not just a symbol. Additionally, the red on the hat may be inspired by the red-feathered heads of many swallows, such as the greater and lesser striped swallows. For shoes, they wear dark geta over white socks closed with buttons. Because of the color scheme, they're occasionally called the "Loafing Monochrome". Tsurubami Senri had impersonated them during the events of Evanescent Existence, making the disguise by using a talisman to melt their clothes and then reshape them. Interestingly, Tsurubami and the hat have a slightly duller eye color than usual in their disguise despite the spell not affecting their body. The priest Tsurubami Senri spirited away Tsubakura, the Shitodo siblings, Kurohebi and Clause to the land of Mugenri. After placing them in different airspaces to train their newfound abilities, Tsurubami took Tsubakura's appearance and started to pick fights with the outsiders in order to test their strength. Worried, their friend Yabusame uses their power to cross over dimensions to search for Tsubakura. Because of this impersonator, you don't actually play as Tsubakura during the main scenario of the game, but instead Tsurubami Senri. The real Tsubakura is playable in the Extra stage. There are various clues dropped around the game which imply Tsurubami's true identity during the main events. One example is the talismans they use in their fight against Yabusame, which foreshadows Tsurubami, since Tsubakura uses technology. Since their impostor and Yabusame have defeated everyone, Tsubakura crosses into Mugenri with ease. They enter the sun that casts a shadow, which is a portal to the Senri Shrine. Tsubakura barges into the shrine and finds Tsurubami. They want a strong person to replace them, and a curious Tsubakura defeats them and agrees into cooperating with them. When Yabusame comes, Tsubakura encourages Tsurubami into attacking them, much to the priest's surprise. The priest was considering Tsubakura to be their replacement, but after witnessing Yabusame's potential, they hand both of them their job as a youkai exterminator. After that, Yabusame and Tsubakura settle in Mugenri. One day, the weather became exceptionally cloudy, so the familiar of the Senri Shrine, Jinbei, forces one of them to go. They decide it with a game of rock-paper-scissors. Upset upon losing at rock-paper-scissors to Yabusame, Tsubakura is forced to resolve the incident, but decides to finish the mission quickly. They encounter Jun Amanomiya, a rain youkai who then proceeds to have a chat about how troublesome rain is. Because Jun's powers are similar to the incident, Tsubakura defeats them to see if they're the mastermind, though it turns out not to be the case. Shortly after, a slug youkai called Shou Amanomori attacks Tsubakura in revenge for having defeated Jun, but they're defeated and the human teases them about how the sun will return to Mugenri. After dealing with Lumen Celeritas, a youkai that claims to be an old hero, and Hibaru Kokutenshi, a youkai salaryman who attacks Tsubakura in a poor attempt to ask for loans; Tsubakura then finds themself in a ritual chamber, where Adagumo no Yaorochi and their partner Sukune Katano are. The two were gathering the spiritual energy of the weather to restore a replica of the Tasouken sword, which is actually the Sword of Kusanagi. Due to poor communication, Yaorochi mistakenly assumes that Tsubakura is there to take their sword away and the two fight. However, after Yaorochi is defeated, the sword attacks Tsubakura on its own. Fortunately, the clay vessel was too much for the Tasouken and it stops. After everything was cleared, Sukune reveals that the clay replica is actually a sword-shaped bottle opener, much to Yaorochi's chagrin. In the end, Tsubakura drinks some sake with them. Days later, the clouds return to Mugenri. Drunk after a party with their new friends at the shrine, Tsubakura goes to investigate. After dealing with an empowered Lumen Celeritas, they encounter the orochi Adagumo no Saragimaru, Yaorochi's younger sibling. They want revenge for having defeated their sibling and ruining their happiness, so they lured them into a trap. When the orochi mentions the word family, Tsubakura is filled with nostalgia for the Outside World, but attacks them anyway. After Saragimaru is defeated, Tsubakura invites them to drink together. After dealing with a few youkai in search for answers, they arrive in the Frost Cavern, where they bump into Yaorochi and Sukune, who tell the humans to go home as they are more interested in the mastermind's identity rather than the long winter. Yabusame and Tsubakura ask them to resolve the incident together, but the youkai refuse. Offended, they defeat them and continue their way. They bump into a strange road, where Taira no Fumikado was trying to collect spirits for their resurrection ceremony. After defeating them, they find out that all the spirits are attracted to a certain location. Finally, they end up in the Withered Grove, where they find a newborn chimera soul, who is the avatar of the soul-eater flower Harujion. Yabusame gives them the name of Shion. Shion can sense people's minds by smelling them, and is particularly interested in Tsubakura because they have a blank, neutral soul, wanting to consume it. Realizing that the Harujion was causing the long winter, the heroes fight them in a danmaku duel. In the end, Yabusame and Tsubakura return to the Senri Shrine, bringing Shion with them, much to Jinbei's chagrin. Shion eats some of Tsubakura's soul (lifespan), but they don't care much about it and brush off Jinbei's concerns. It's revealed that the spirits came to Mugenri because of a hole in the Mugenri Barrier that separates the land from the Outside World. The hole was caused by Lumen, during the Clouds Incident and Tenkai Zuifeng was tasked to repair the hole, but it is taking too long. Yabusame and Tsubakura go to confront Tenkai, while the latter is curious if the two are strong enough to replace Tsurubami as protectors of Mugenri. On the way back home, they are ambushed by Sese Kitsugai, a youkai they had defeated at the beginning of the story. Sese absorbs the spirits the heroes had been recollecting and transforms into a much more powerful form, but they are still defeated and the spirits leave their body. In all routes, Tsubakura and the others deal with a few youkai and some of their human aquitances, attacking everyone they can find in order to get information for the sake. Everyone else warns them about an upcoming war between the Dragonfly Army and the Capital City, but Tsubakura and the others don't pay attention to it. At the end of the Brilliant Pagoda or Haze Castle routes, Tsubakura, Yabusame and Shion do find out more about the war and they're scolded for it (since they could have prevented it instead of playing around and searching for sake). In the end, they meet Suzumi Kuzu, the one responsible for attacking the Shitodos earlier that day and who said the words about the "The mirror of Heaven shall split" in order to lure Tsubakura. Suzumi reveals their intention to make Tsubakura's life a living hell and after a hard fight, Suzumi erases their memories again. Yabusame is the only one who remember the whole affair, but is quickly dismissed by Shion and Tsubakura, believing that Yabusame is just being ditzy as usual. Tsubakura is set to be a playable character in Book of the Cafe. In a battle state prototype, they can attack with a paint brush. Tsubakura has been friends with Yabusame Houlen for a long time, but with Yabusame being gullible and slow, Tsubakura tends to pick on them a lot. They are often annoyed or unfazed at Yabusame's airhead personality. Kuroji and Tsubakura hate each other because of their arbitrary ways of thinking. Kuroji is secretly jealous of Tsubakura's talent. Their interactions consist in polite insults and sarcastic remarks. But on the other side, perhaps due to knowing each other for a long time, Kuroji is worried about Tsubakura at times. For example, Kuroji is horrified when they find out that Shion consumes Tsubakura's lifespan on a daily basis. And they believe that Tsurubami doesn't have good intentions for Tsubakura. Also, it seems Kuroji trusts Tsubakura enough, since they went to them when Hooaka was injured due to Suzumi. Jinbei is a familiar of the Senri Shrine while Tsurubami Senri is the priest of the shrine. Tsubakura seems to respect Jinbei a lot and calls them "Sensei", but they're also prone to Tsubakura's pranks. Despite Tsubakura's anger towards Tsurubami for impersonating them, they volunteered to replace Tsurubami as the current youkai exterminator, along with Yabusame. Shion and Tsubakura are generally on friendly terms. Shion becomes very attached to Tsubakura after noticing that they have a neutral soul and wants to consume it. Tsubakura dislikes Shion's clingy and childish attitude and considers them an annoyance. Nonetheless, Tsubakura allows Shion to consume their soul on a daily basis. There is a possible relationship between Tsubakura and Kurohebi. There are vague hints about why Kurohebi is only nice and respectful towards Tsubakura, implying a connection between the two. It's implied that Tsubakura might be their creator because Tsubakura is a young genius scientist; this is not a far-fetched theory. Both are related to the color black. Kurohebi's name has the kanji for black, and Tsubakura is related with the black color. Their spell cards include black patterns and knives. Also, Kurohebi is displeased at how Tsubakura has officially adopted Shion and dumped them. Suzumi has an unhealthy obsession with Tsubakura and mockingly calls them "Tsubakura-sama", teasing and threatening them all the while. In the past, while they were in the outside world Suzumi had tried to kill Tsubakura several times, endangering Yabusame in the process. In return, Tsubakura is afraid of Suzumi's sadistic tendencies and campy personality. Also, Suzumi is overly delighted by tormenting them and wants to use their newfound powers to ruin Tsubakura's life, in order to make them feel more despair then they felt the day Tsubakura's mother died. ↑ According to JynX, Monochrome Ray's immense power comes from it being compressed and released, and thus widening the ray would only weaken it. ↑ A variation on Tsubakura's bomb and fourth card from Evanescent Existence. In Evanescent Existence, Tsurubami as Tsubakura has curly hair and is seen smiling. However in the Extra Stage, when the real Tsubakura appears, they have straight hair and are seen frowning. The real Tsubakura does not appear until the Extra Stage. Tsubakura's face is shown on all of the game icons on the .exe files. Tsubakura is capable of speaking English, having understood, and responded to Tsurubami Senri using the language during their encounter in Evanescent Existence's Extra Stage. Tsubakura's flying speed without anything weighing them down can get up to 2600km/h, which is a little over Mach 2.